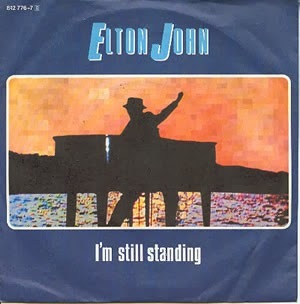 "I'm Still Standing" is a song by British rock musician Elton John, from his 1983 album, Too Low for Zero. Too Low for Zero is the seventeenth studio album by British singer/songwriter Elton John, released in 1983. Sir Elton Hercules John CBE (born Reginald Kenneth Dwight on 25 March 1947) is an English singer-songwriter, composer, pianist and occasional actor. He has worked with lyricist Bernie Taupin as his songwriter partner since 1967; they have collaborated on more than 30 albums to date. In his five-decade career John has sold more than 250 million albums, making him one of the best-selling music artists in the world. His single "Candle in the Wind 1997" sold over 33 million copies worldwide, and is the best selling single in the history of the UK Singles Chart and the US Billboard Hot 100. He has more than 50 Top 40 hits, including seven consecutive No. 1 US albums, 56 Top 40 singles, 16 Top 10, four No. 2 hits, and nine No. 1 hits. He has received six Grammy Awards, five Brit Awards (including two awards for Outstanding Contribution to British Music and the first Brits Icon in 2013), an Academy Award, a Golden Globe Award, a Tony Award and the Kennedy Center Honors in 2004. In 2004, Rolling Stone ranked him Number 49 on its list of 100 influential musicians of the rock and roll era.